I have always pulled the fuse---as my "poor man's" battery shutoff solution. However on my last trip, the radio and the propane detector shutoffs were apparently not enough. Is there ONE fuse I can pull to shut it all down? Do I need to shut the breakers off too? If you have a battery disconnect switch (twists between red and green), mounted on the front frame of your trailer, twist it to show red. It will disconnect the power between your battery and everything that draws power. If you do not have one of these, I'd suggest that you purchase a batter disconnect safety switch and have it installed. Good luck! Yes, I agree; in doing some online research, I realized that most would require me to lift off the battery box lid......I could just loosen the wing nut at that point. I was wondering if the main fuse under the sink (the one in the wooden box) would "pull the plug" on the whole system? It that fuse in the wooden box is labelled Vehicle Battery - 30 Amp - Fusible Link then that one will do quite nicely to totally disconnect your battery from the entire system. BTW, that would not be a bad place to install one of those heavy duty battery disconnect switches. While it would be preferable to have the switch as close to the battery as possible, there are weather issues associated with mounting a switch out on the A-frame. That would mean you'd have to find a similar weather-tight box to the one that Sunline used on newer trailers. Installing a switch inside the trailer eliminates the water/weather issues. The switch Sunline used is made by Blue Sea part no. 9006. I'm not into boats, but this sounds like something you might find there too. I haven't posted photos before so I'm going to give it a shot. One of these LCD volt meters is also really handy for monitoring your battery condition. I think I need to plug my trailer in and do some charging. 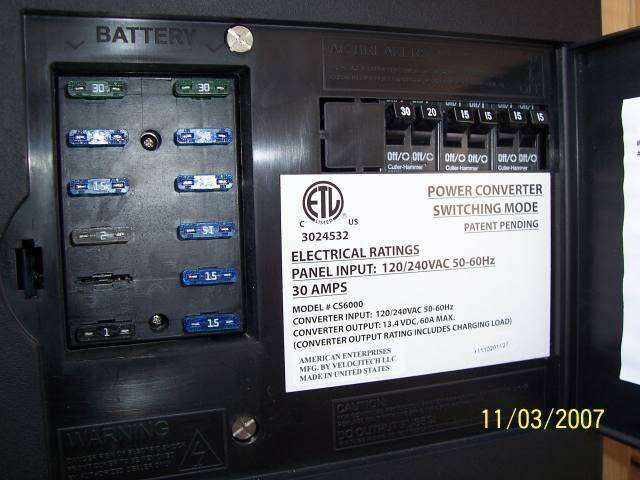 Those 300 amp marine battery switches from bluesea would certainly do the job, but probably with a major price tag. A 2003 model Sunline, What power converter do you have? 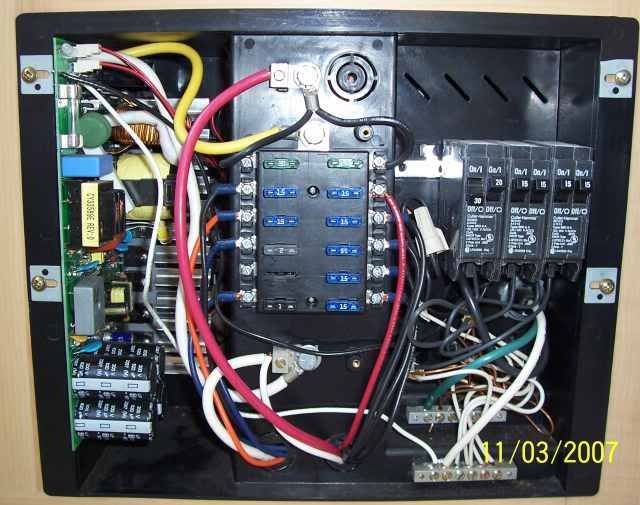 If it is an American Enterprizes and looks like this, pull out the qty 2, 30 amp green fuses in the top slots. Those 2 fuses feed the DC bus bar in the converter panel to the battery. See this pic. If you re really into this, you can see the Red battery hot lead, then it splits to 2, 30 amp fuses to feed the rest of the circuits. Switching off the 120 breakers will not do anything for draining the battery. It is on the AC side of the fence. I do not know your exact model or the fuse under the bed. But my 2004, T310SR, made in Oct 2003, had the disconnect switch on the frame. I had heard that the 2004 year model was when the rotary disconnect came about. If that fuse under the bed, is the 30 amp to the battery, then yes it too will detach the battery. The converter box maybe be handier then under the bed pending your layout and converter. Yes unhooking the battery will for sure do it. But dealing with that Attwood battery case strap if one real pain in the foot after each camping trip. That is if yours has that same strap. Every time I take mine off, I have to refigure out how it goes back on. Thanks for all the posts, I will try to two 30 AMP fuses first, and makesure the whole trailer is dead (radio, etc. ).